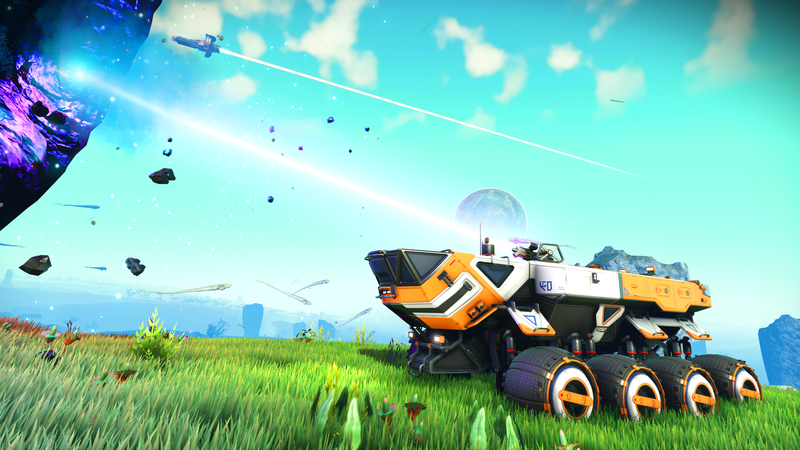 After announcing it earlier this week, Hello Games today launched a big new update for No Man's Sky. The Path Finder Update, as it's called, adds new vehicles, a permadeath mode, base-sharing, a ship and weapon specialization system, and PlayStation 4 Pro support, among other things. The update is detailed on the No Man's Sky website (via IGN) and through the announcement video below. In terms of PS4 Pro-specific features, players can expect 4K resolution; this was the only PS4 Pro feature announced for No Man's Sky. Hello Games added that 4K rendering on PC is now "optimized." As for the base-sharing feature, as its name suggests, this lets players share their based across the internet. You can do this with Steam Workshop, which players can use to find and rate bases. The ship specialization feature is broken down into four categories: Shuttle, Fighter, Hauler, and Explorer. "Shuttles are all-rounders, Fighters specialise in combat, Haulers have expanded cargo holds, and Science vessels feature increased warp capabilities," Hello Games said. Additionally, all ships are now rated by class (A, B, C, or the rarest, S), while players now have the option of trading their current ship for a discount when buying a new one. Another big part of the Path Finder Update is the new Exocraft vehicles. "These land-based vehicles give new meaning to planetary navigation, combat, and mining--and can be summoned from anywhere on the planet they were constructed upon," Hello Games said. There are three of them: Nomad, Roamer, and Colossus. Each has different attributes; for example, the Colossus, the biggest one, is good for carrying a lot of cargo. They can also take part in another new feature: races. Players can make a course and create a time trial, then challenge others to beat it. Today's No Man's Sky patch also adds an ultra-challenging Permadeath mode. "The consequences of death will be absolute," Hello Games said. Additionally, the game's other super-tough mode, Survival, sees its difficulty further increased as well. "Dying in space will now restart you on the nearest planet's surface, away from your crashed ship," the studio said. New trophies for Permadeath and Survival modes have been added as well. The Path Finder Update also adds a photo mode, improvements to the Discovery menu, and a number of "quality of life" improvements such as NPC text now appearing faster; it can also be skipped. Additionally, the Mission Log now lets you track multiple tasks at once, while the UI has been made easier to read. This is just a sampling of what's new in the Path Finder Update. It's a massive update, go to the game's website to see a full rundown.